Heavy Rain Officially Releasing on February 23! Many people have been asking about when precisely Heavy Rain is going to hit store shelves in North America. Well, I’m here to deliver great news to those of you who are antsy to dive into this highly anticipated PS3 exclusive being developed by Quantic Dream. Fans of Heavy Rain can get their hands on this highly emotional thriller beginning Tuesday, February 23rd at participating retail stores. As mentioned last month, players can pre-order their copy of Heavy Rain now at participating retailers, and will receive, for free and before anyone else, the first episode of The Heavy Rain Chronicles (valued at $4.99 each episode) titled, “Heavy Rain: Chronicle One – The Taxidermist”. Still don’t know enough about Heavy Rain? Check out our GamesCom posting to meet Heavy Rain’s director and co-CEO of Quantic Dream, David Cage, as he takes fans through one of more than 50 scenes this spectacular journey has to offer. Continue to check back here on the Blog to get the latest news about Heavy Rain. We’ll have more to come in the next couple of weeks! Which retail stores in Canada will be providing the episode? Also, any ideas when they will get them? They should have the codes by now! In Canada you can preorder at the following retailers: EB Games, GameStop and Amazon.ca. Feb. 23? AWESOME!! I CAN’T FREAKING WAIT!!! I’ve wanted this game since it was first announced. It’s going to be EPIC! are the episodes playable separately? Nope. You\’ll need a copy of Heavy Rain to play them. I never understood the concept of finished games being released at different times until now. God of War, White Knight Chronicles, Gran Turismo, Alien vs Predator, Dark Void, Final Fantasy 13, and Heavy Rain. And HR is one of my most anticipated, but I was hoping for a later release. Time to put in some overtime. This is great news, but damn, early 2010 is crowded as hell. Oh yea!! cant wait. i already preordered my copy! Less than 8 weeks away!! Fantastic news. Very much anticipated title. Really hoping for a “Silence of the Lambs”-esque type experience, something fresh and new. And hopefully the replay value on this title isn’t too low. Where is the marketing for this game? Especially towards the audiences that would actually buy it (ie, not the gangsta CoD crowd that makes up current the majority of HD console owners and gaming media). Last time I checked the pre-order numbers were garbage and the media hype is about average which is very unfortunate. Heavy Rain could have turned the industry on its head and ushered in a new era of gaming, or at least a new genre breathing some life into things. I look at HR’s release date like Groundhog Day for the games industry. Unfortunately, it seems like on HR’s launch day the weather will be bright and sunny, the groundhog will see its shadow, and we’re going to continue enduring a long cold winter of completely uninspired shooters and sequels. You know, I’ve not been paying much attention to this game up to this point, but I don’t think I can really afford to do so, now that it’s so close. It looks seriously amazing. Though Sindred has a point- you know that it’s a lot less likely that any of these games are going to get nominations as Game of the Year or anything else at the end of the year just because they are already grouped at the beginning of the year. Look at Grand Theft Auto 4 (the original) and Killzone 2. I was originally very iffy with whether or not I wanted to buy this game, given the style of play. I loved the look the first time I saw it. Then I started to fade from wanting it. 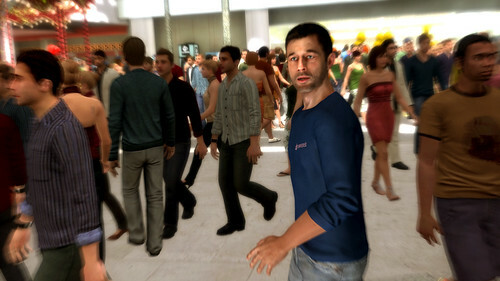 But that Qore feature last night on Heavy Rain made me want this interactive experience all over again. It really looks fantastic and seems so new and fresh. So you sold me on it. It looks to be one of my favorite games of 2010 & that’s saying a lot since I’m looking forward to God of War 3, Mass Effect 2, Final Fantasy XIII, and Splinter Cell Conviction to name a few. Hope it does really well, you guys deserve it. Feb got Heavy Rain and White Knight, but March 2010 is crazy, FFXIII, Yakuza 3, GOW3; all huge games packed into such a short period, somebody like me can only buy 1 from all these gems. I just hope Sony can distribute their game launches more evenly over the year so not to lose potential sales. Bring it on. Looking forward to play something unique. I’m going to be a bit to busy with Star Ocean and White Knight Chronicles to even remember to buy this game. By time I finish those two, FFXIII will be out and then God of War 3. So expect sales through April for this game as it’s not going to break any sales records with that release date. Looking forward to it when I do get it. Seems to be quiet an experience. this looks good – i like it when game developers are pushing the creative envelope. gaming has come a long way! Which versions will come with Portuguese audio/subtitles? There will only be one North American SKU and it will support Spanish, English, French and Portuguese audio/subtitles. I’m sad that we are not getting the Collector’s Edition in NA. This seems like the kind of game I will get the Collector’s Edition for. By the way, is there an official ESRB rating for this game yet? I would love to see this marketed as well but all I really care about is that I will have it. I just would like good developers to make money. QD really deserves to have this masterpiece become a hit. At least I get to play it and judging by Idigo Prophecy, this will be in my top 10 of all time and even be #1. Will there be a demo at all for this epic of a game? Wow, so soon! I can’t wait to get my hands on this game! i thoguth we saw the 16th in this months episode of qore…oh well can’t wait either way…have had mine on pre-order for a while now…hopefully i still get the free episode….will EBGames in canada be giving them out? My copy is already pre-ordered and paid off in full, can’t wait! Yes! Really excited for this game. In fact its one of my most anticipated games of the year (and Last Guardian). I mean of course I want GoW3 and FFXIII but I’ve played those before, this is something unique and I’ll be picking this up day one! Looks so freaking awesome guys. I hope this game lives up to the hype and then blows our minds just for good measure. I have a strong feeling it will. A must buy for me. Can’t wait. i saw your reply about pre-ordering at ebgames are you able to clarify if my existing pre-order(i pre-ordreed before this was announced) will be elegible for receiving the episode? It should, but we don\’t manage retailer processes. You\’ll definitely want to check in with them. So it is not the 16th as I read last night? Dammit, but its only a week, so it not that bad. Already preorder and paid out for this game months ago. I do have one complaint and that has to do with the pre-order bonus. Why will you be charging people that hasn’t pre-order the game a price for content that others will be getting for free? Why not do wat EA did with dragon age and all the copy of the game give you the first episode for free and pre-owned copy will have to pay extra? I think that was an excellent move my EA because it people buy the new copy rather than a used one. AGAIN end of the month?!!! i’m looking forward to it. i’ve got my copy bought and paid for already. I cannot wait for this. I will definitely place a pre-order prior to release as I’m down to support all story-extending DLC for this little gem. Um, wait a second. Japan gets this game on the 18th of February and the rest of the world gets it after that? That doesn’t make any sense whatsoever. February 16th was a perfectly acceptable release date for Heavy Rain in North America – what happened to that? @ Black_Chamber: Are you really going to take the time to whine over a petty one week (if that) delay? Then again, I took the time to acknowledge your post. Amusing. I was just reading some more news on it and can’t wait for this game. I am one for different game experiences. They dont want to sacrifice White Knight which comes a week before that. They killed Ratchet sales with Uncharted 2 the week before and also Pacific Rift with LBP. They know better by now that there is people out there who only buy sony exclusives, is better to not make them choose between their own. I already have this paid off, and the release date is only a couple days back then what qore said, which works for me. Between this and WKC, it’ll be a good feb. I am really looking forward to HR. Can you tell us if the voice acting was improved for the final release version? Great Sony, ad this to the list of great looking games coming out Feb-March. There is no way I can buy more than 1-2 games in this time period, most of these great titles will get missed because your incredibly poor product placement. If anything should be delayed the most its MAG of course though. That and GOW3 should just be delayed until summer. Will there be any home content for Heavy Rain on Playstation Home? sorry so meny posts…any word on a demo from QD?